Edinburg Children's Hospital is equipped with advanced diagnostic technology to help doctors quickly identify injuries and illnesses without the need for invasive diagnostic procedures. 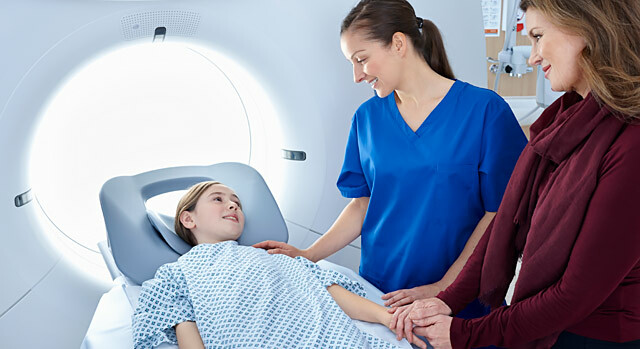 Children who undergo imaging procedures may need to be sedated to help keep them in proper position during testing and to help relieve anxiety and pain. Nuclear medicine, which uses radioactive material to diagnose and determine the severity of disease, offers unique information about organs in the body that other imaging methods may not provide. This form of imaging can often identify abnormalities very early in the progression of a disease; this enables treatment to begin at the earliest stage of a disease. Nuclear medicine is used to diagnose and monitor a wide range of diseases, including various cancers, heart disease, endocrine, gastrointestinal and neurological disorders. Magnetic resonance imaging (MRI) uses radio waves and a strong magnetic field to create clear, detailed images of internal organs and tissues. MRI uses radio waves, not X-ray, so no radiation exposure is involved. However, many studies require a small intravenous injection of a contrast agent. This agent does not contain iodine, an element used in other contrast agents for X-rays or CT scans. MRI is often used to evaluate or diagnose orthopedic (spine, extremity) or neurologic (brain, spinal cord) abnormalities. During an MRI, a patient must lie still on a table that slides inside a tunnel-shaped machine. Children sometimes find an MRI to be an anxiety-inducing experience, as the equipment can produce loud banging and whirring noises and they must lie still, sometimes for up to 90 minutes, in a small space. To help make the experience a more pleasant one for kids, technicians at Edinburg Children’s Hospital uses the Vantage Titan 3T MRI. The system's powerful magnet speeds exam time for patients and is one of the quietest systems available. Because of it's "open bore" design, children may feel less claustrophobic and be able to undergo the scan without sedation. Patients having their spine or pelvis examined can rest with their head and lower extremities outside of the magnet and some patients can enter the scanner feet first. Pediatric MRI exams are also easier to perform and more comfortable as the components conform more closely to a child’s anatomy for more accurate diagnoses. X-ray (also called radiography) uses a very small dose of radiation to produce pictures of the inside of the body. X-rays are the most frequently used form of medical imaging and they are also the oldest. They are often used to help see bone fracture, injuries or infections; they are also used to locate foreign objects in soft tissue. In some cases, X-ray exams are used in conjunction with an iodine-based contrast material, which is injected, to help doctors see certain organs, blood vessels or tissue. Fluoroscopy is the study of moving body structures, similar to an X-ray movie. It is used in many various procedures, such as cardiac catheterization, biopsies, the visualization of joints and lumbar puncture. Fluoroscopy can also be used to locate foreign bodies and in the injection of anesthetics into joints or the spine.